A sure-fire way to learn just how rare the books in a rare book library can be is to try documenting potential evidence of their existence. Since May, I have scanned images of 164 books and pamphlets at Houghton. The demands of the task required me to call for items in batches, instead of attempting to gather all the target books at once. When I wasn’t working on other projects or requesting anywhere between 10 and 20 books, I ventured to Houghton’s conveniently large overhead scanner to capture images. I sought title pages, colophons, and anything else that appeared to hold clues about the book’s content and printing information. Occasionally, I may have overestimated the number of images needed, but I thought, “Better safe than sorry.” After all, I wasn’t collecting information for myself, but for someone else. At a first glance, a great number of these books had languages in common: Spanish, Portuguese, and sometimes Latin. However, I also came across a book printed in Hebrew (Heb 2000.79), the only one of its kind from my long list. Equally varied were the subjects, which spanned works related to agriculture (Typ 560.63.450) and colonialist ventures in Mexico (SA 3404.5). There were books discussing Catholic-Protestant relations in Ireland (Br 11920.21) and showcasing variations in script (TypW 532.94.225). 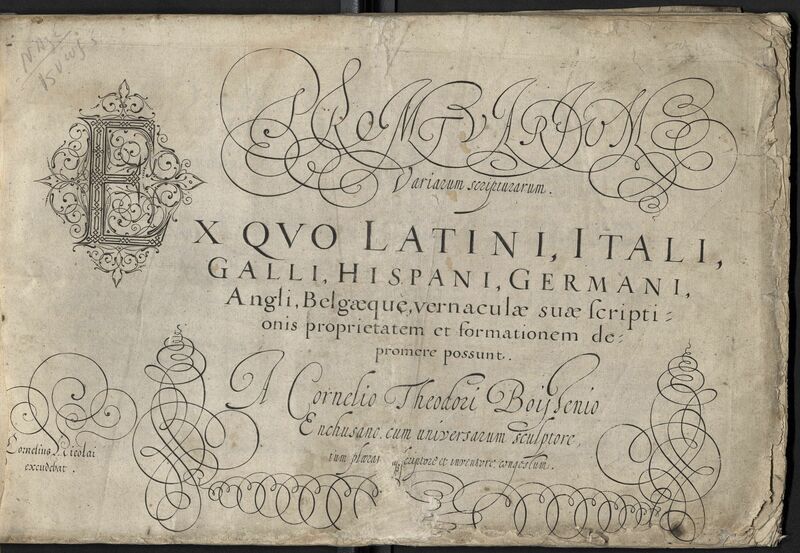 My quest later led me to a peculiar sammelband (SC6.A100.B650a) containing many pamphlets, printed and manuscript, bound together; I scanned images for 33 of those works. 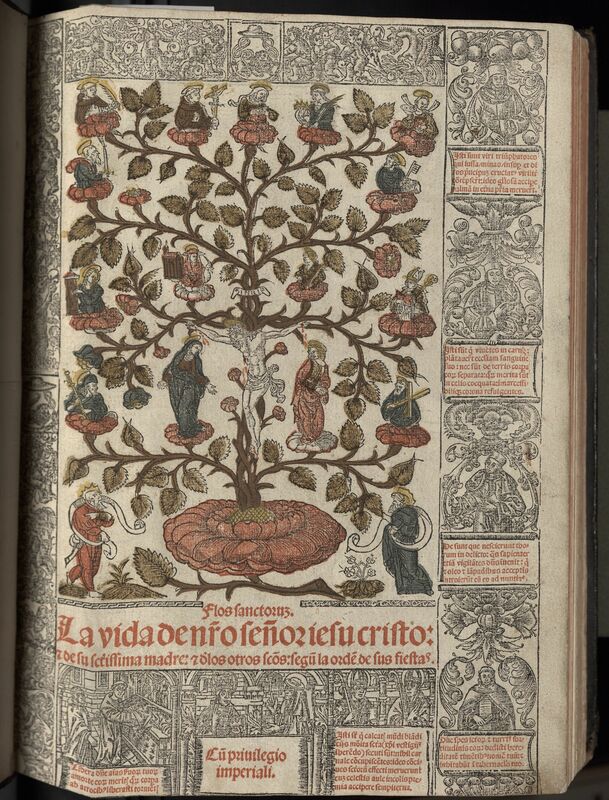 The most common works appear to be treatises on prayer, theology, and religious history: one such book is Typ 560.21.867, whose title page boasts one of the few, if not the only colored woodcut of the bunch. What links all of these books together is their significance to the Iberian Books project based at University College Dublin in Ireland. According to the main Iberian Books webpage, the project aims to “produce a foundational listing of all books published in Spain, Portugal and the New World or printed elsewhere in Spanish or Portuguese during the Golden Age, 1472-1700.” Books are classified according to the availability of surviving copies and the bibliographic evidence of their existence. I have scanned images of books that not only meet the criteria (in particular, those printed in 1472–1650), but that may also be unique copies. From the project staff’s perspective, there is currently a lack of substantial evidence that these items exist. Scans could help confirm whether the books truly exist or whether their records were inadvertently produced. If a copy of a book exists only at Houghton, it may become all the more important to the library’s efforts to strengthen the visibility of its holdings. The insight that book could provide readers of the present and future can be preserved, rather than lost to the ages. Alicia Bowling is a rising senior at Smith College and a summer intern in Early Books and Manuscripts.